In the Yadia’wish room (the Turtle room), overlooking the river, the Museum presents a continually updated calendar of exhibits found here and in other institutions. Whether artistic or ethnological in nature, these exhibits allow visitors to further their knowledge of specific aspects of Wendat culture, discover other Amerindian cultures, or appreciate the genius and creativity of Aboriginal artists of yesterday and today. Contact us to learn about current and upcoming exhibits! Hannah Claus – “animations” from February 16 to April 21, 2019 as part of Manif d’art 9 – The biennale of Quebec. Hannah Claus invests the Yadia’wish (Turtle) gallery with three video works («all this was once covered in water», «everlasting», «interlacings») “) and a suspended sculptural work («birds») highlighting the interconnections between the Earth and its plants; water and its reflections; the Sky and its stars. The exhibition is part of the Smalls Between the Stars, Large Against the Sky program, alongside a set of linked exhibitions elaborated by the international curator, Jonathan Watkins. 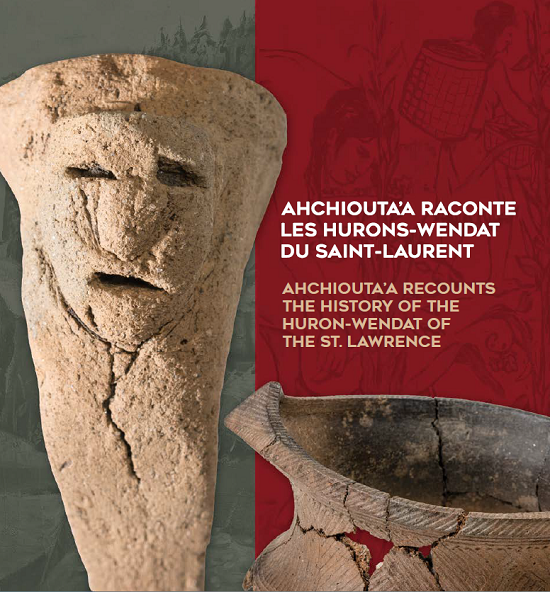 An exhibition of Michel Plourde and the result of a close collaboration between the Huron-Wendat Nation, of which the Bureau du Nionwentsïo and the City of Québec. “We, the Huron-Wendat people, are the “St. Lawrence Iroquoians”. We are and always have been one and the same people. Our oral tradition teaches us that our ancestors lived in Stadacone. Our culture, our language, our mythology and our ethnicity are one.” – Grand Chief Konrad Sioui. The exhibition allows the Huron-Wendat to share their vision they have of their history and ethnicity. It presents numeros and precious artifacts from the St. Lawrence Valley and the Great Lakes, some dated from many centuries before the founding of Quebec City. Audiovisual media allows the visitors to hear Ahchiouta’a (a Wendat ancestor born in Stadacone)’s accounts on parts of her people’s History, like oral tradition, trade, language and the arrival of the Europeans.